About the Project – Sugar vs the Reef ? Sugar vs the Reef? is a project by Lucas Ihlein and Kim Williams, in collaboration with artist Ian Milliss, farmers Simon Mattsson and John Sweet, and a host of community members in Mackay, Queensland. Sugar vs the Reef? extends the research undertaken in The Yeomans Project into a mega-scale environmental management situation. 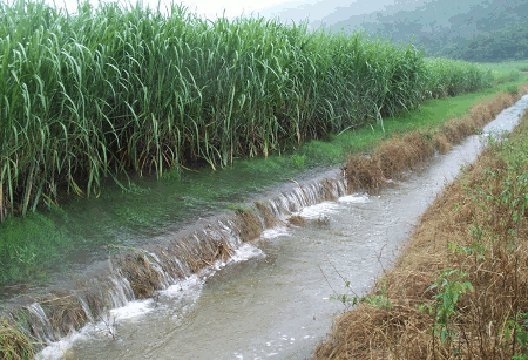 In recent years, much attention has been given to the impact of agriculture, and in particular sugar cane farming, on the Great Barrier Reef. In 2014, artists Lucas Ihlein and Ian Milliss were invited by farmer, Keyline design consultant and environmental activist John Sweet to collaborate on a project to learn about sugar cane farming practices in Queensland. Read about the origins of the project here. Between 2015 and 2019, a team of artists including Lucas Ihlein and Kim Williams are working with a broad range of collaborators in Mackay to explore grass-roots cultural change leadership from within the farming community. We celebrate the experiments and innovations of forward-thinking farmers. In July 2017, we presented Sunset Symphony in the Sunflowers in collaboration with Mackay farmer Simon Mattsson. This involved the carving of an amphitheatre from a crop of sugarcane and sunflowers, and staging a concert celebrating local culture and regenerative agriculture. More info here. Currently, the team is working on the Watershed Land Art Project, which involves the planting of an experimental crop of sugar cane and sunflowers at the Mackay Regional Botanic Gardens. This project is a collaboration with farmers and members of the Australian South Sea Islander Community. You can follow this project here. An exhibition based on Sugar vs the Reef? and will be presented at Artspace Mackay in November 2018. Sugar vs the Reef? is a central project for Lucas Ihlein’s ARC DECRA research (2016-18). It is also one of several collaborations exploring art, agriculture and ecology to be carried out by Lucas as part of his Australia Council Fellowship (Emerging and Experimental Arts) 2015-17. During 2016-17 Lucas is an Australia Council Fellow (Emerging and Experimental Arts).